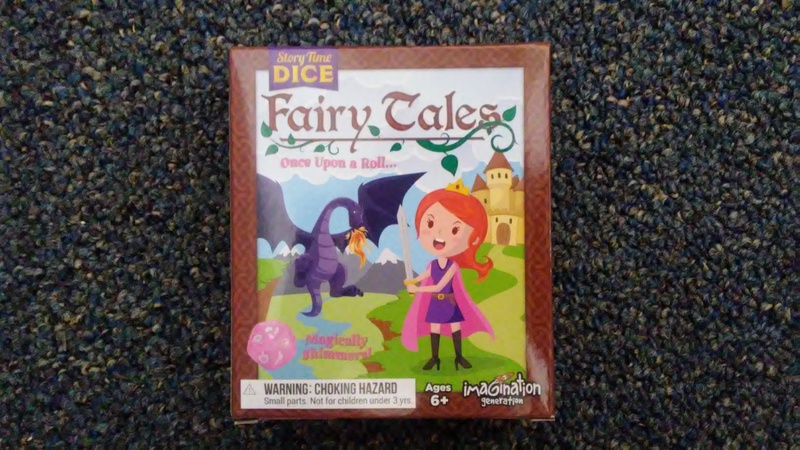 Story Time Dice: Fairy Tales is a game by Zach Roth, published by Imagination Generation and Brybelly. It is for 1-7 players. In this game, players will become story tellers as they set forth to tell an epic tale of good vs evil throughout a fantastic fairy tale world. Along the way, they’ll use their imagination to overcome obstacles with the help of some powerful tools. Of course no good fairy tale can be told without a twist. In the end, will the hero be victorious or will they know utter defeat. Their fate lies in the hands of the story tellers. This game can be played in any way the players would like. The rulebook includes 7 different games that may be played with the dice. In this review, I will discuss a few of them. For more ideas and information, please check the rulebook. The two games that we’ve played the most are “Once Upon a Time…” and The Never(? )ending Story. These are some of the most basic ways to play. The first one that I’ll explain is “Once Upon a Time…”. In this game, players will take turns telling a story. On a player’s turn, they will roll all 7 of the dice to determine the Setting, Hero, Villain, Obstacle, Tool, Twist and Ending of their story. The player will then begin to tell a story using each of the seven elements. Of course, they’ll have to make sure and begin the story with, “Once Upon a Time…”. The next game is called, The Never(? )ending Story. For this game, the dice are divided up equally among the players. The Endings dice, however, is left out. To begin, the player with the Hero dice will roll their dice first. They will then begin to tell the story using the hero rolled, along with any other dice. As soon as the player gets stuck with the story, the next player in turn order rolls their dice and continues the story where the previous player left off. They will need to add the elements from their dice roll to the story. This continues until all the dice have been rolled. The dice are then redistributed as equally as possible and the dice rolling and story telling continues. 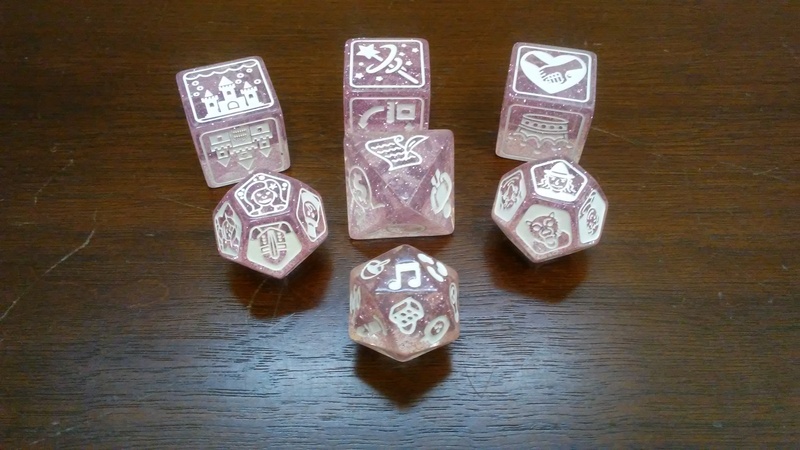 Once each of the dice have been rolled at least two times, one of the players rolls the Endings dice and finishes the story. It should be noted that players may roll more than twice if they choose to play a longer game. In this game, there are no winners or losers. The idea is to spark imagination and creativity and to just have fun telling stories. The only components that come with this game are 7 huge polyhedral dice. When I say huge, I mean HUGE! These things are like 2 to 3 times the size of a normal die. I can honestly say that I’ve never seen dice this large before, apart from maybe those fuzzy dice that people would hang over the mirror in their car. Unlike the fuzzy dice though, these things are solid plastic and are very durable. 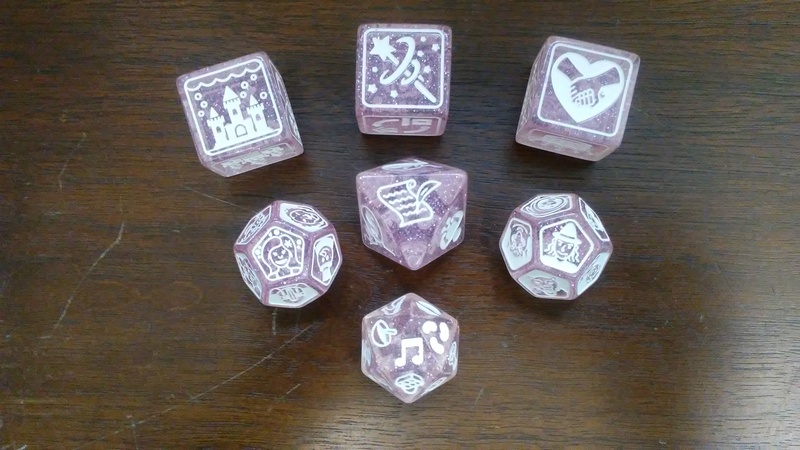 Each die is kind of see through with lots of pink glitter on the inside that shimmers like a star when placed in the sunlight. As soon as my daughter saw them, she immediately fell in love with them. I mean after all, they’re pink and glittery. Each die contains one of the 7 different story elements; Hero, Villain, Tool, Setting, Obstacle, Twist and Ending. Each face of the die is a different image. So for instance, the Hero and Villain dice are both 12 sided, giving players 12 different heroes and villains to use in their storys. The Obstacles die is 8 sided, the Tools die is 12 sided and the Settings, Twists and Endings dice are all 6 sided dice. Each of the different images is pretty easy to pick out and understand. However if anyone needs help, the rulebook includes a dice guide that tells what each symbol represents on each die. I think the images are really fun and cute. Even without the dice guide, it’s pretty easy to figure out the different icons. Overall I think the dice themselves are really cool looking and are a lot of fun to roll. I mean, it’s not every day you find dice this big to roll. Everything comes packaged inside a cardboard tuck box that is easy enough to carry with you anywhere. I really think that everything looks really nice and it definitely gets my daughter’s stamp of approval. We’re both very pleased with the dice. The rulebook for this game is a double sided, tri-folded sheet of color paper. The paper is actually pretty thick and is a lot more sturdy than usual paper. On one side there are the rules for 4 regular games that can be played with the dice, as well as 3 more advanced ways to play. One thing to note, the last game included in the rules can only be played if either the original Story Time Dice or the Scary Tales expansion are owned. I just wanted to point that out. On this side of the sheet, there’s a cute picture of a princess with a sword fighting a dragon. Looks like she didn’t need Prince Charming to save her. At the bottom of the page is a bunch of various characters running around. The back side of the rules is the Dice Guide. This is a black and white guide to each of the 70 different dice faces found on the dice. Each particular die has it’s own section with a picture of the die face along with a label telling what it’s supposed to represent. Of course these are suggestions and may be changed or swapped to anything the players choose. It’s completely up to them. Everything in the rules is very easy to follow and understand. As a matter of fact, it only takes a couple of minutes to read over everything. Players simply need to choose a way to play and they’re ready to go. Overall I think the rulebook does a good job of explaining everything. I’m particularly happy with the Dice Guide. That side of the rules can be left out on the table or wherever you choose to play as a reference for the dice faces. Needless to say, I like how simple the rules are and I also like that there are so many different ways to play. If you’ve ever played with Rory’s Story Cubes, then you’re probably familiar with the concept of rolling dice and telling a story. It’s not really all that hard to understand. However the actual story telling, that takes work. For some, it’s quite simple weaving the different elements into a story that’s worth telling. For others, it may take a bit of practice and possibly even some help. My son is one of the latter. He can tell you all the history behind a particular type of gun or piece of machinery that was used during World War II and have you completely spellbound by his narration. However ask him to tell a story that uses imagination and creativity and he will stare at you like a cow trying to do calculus. It just doesn’t click with him. My daughter on the other hand is more like me. She can create some of the wildest and most imaginative stories that you’ve never heard before. It’s always interesting to sit in on one of her play times with her dolls and toys. Let me tell you, I’m still wondering how Apple White is going to find the perfect dress in time for the prom. I’m guessing it’ll come down to Ariel and some mermaid magic. That’s just my thoughts anyway. Needless to say, if you actually read the section on the components, you’d know that my daughter already loves the dice for this game. My son, on the other hand, was a bit reluctant to play with such girly looking dice. No need to worry though, we took care of that with Scary Tales dice. Expect to see a review for them very soon. In any event, the dice are great and they’re a lot of fun to play with. I love telling stories so these are quite cool to spark some inspiration when you have a bit of story teller’s block. They’re also fun and quite usefull at helping kids to learn to write stories. As a home schooler, these work great for that purpose. Want the kids to work on their handwriting, roll the dice and have them write a story using the elements from the dice. They can then work on their verbal communication and read aloud skills by having them read their story out loud. There’s just lots of creative ways that the dice can be used. Fans of Rory’s story cubes will enjoy these dice, especially since they’re about twice the size of Rory’s. The dice are family friendly and lots of fun for all ages. As a home schooler and parent, I would definitely recommend getting a set of these. They are a welcome addition to your teacher’s resource arsenal. For more information about this and other great games, please check out Brybelly at their site. This entry was posted in Reviews and tagged board, board games, brybelly, card, card games, dice, fairy, fairy tales, games, generation, imagination, imagination generation, roth, story, story time, story time dice, tales, time, zach, zach roth. Bookmark the permalink.